It's been another long day, but I'm going to bust out two blog articles late this evening to recap the six games played today at the 2014 Lincoln Stars tryout camp. It all started early this morning at 7:00am with the first game, and the sixth and final game of the day ended at 7:30pm. That's a lot of hockey with only a 1:15 lunch break. So far, I've been pretty impressed with the amount of talent here at camp. It's going to be tough to whittle this roster down to only 23 players to start the season. I don't envy the GM and the coaches. Before I get to the recaps, I wanted to mention the particulars of how each of these games are played. Each game consists of two 32-minute halves (running clock). If any penalties are called by the refs on the ice, the player on the receiving end of the penalty gets to try a penalty shot. Team Backes (Black) got out to a quick 5-1 halftime lead before holding on for a 9-6 win over Team Dzingel (Yellow). This game was very sloppy at times, and I think that may have something to do with the early 7:00am start time. Players are required to be at the rink 60 minutes before their game, so that means these kids were at the rink at 6:00am getting ready. Scoring goals for Team Backes was Blake Christensen (2), Troy Terry (2), Angus Scott, Nathan Dingmann, Jonathan Desbiens, Jake McLaughlin, and Elijiah Barriga. Scoring goals for Team Dzingel was Biagio Lerario (3), Willie Brown (2), and Danny DiGrande. Team Backes goaltender Jacob Nehama played the first half of this game and gave up only one goal, however he was not tested much. His team played very well in front of him and limited the amount of shots that got to him. Team Backes goaltender Holden Kurtz played the second half of the game and surrendered 5 goals. Team Dzingel goaltender Tanner Creel started the first half of the game and gave up 5 goals. Team Dzingel goaltender Josh Creelman started the second half and gave up four goals. Players from Team Backes who stood out to me were Troy Terry, Wes Michaud, Blake Christensen, Ryan Jones, Jonathan Desbiens, and Angus Scott. My MVP of Team Backes goes to forward Blake Christensen who had two goals and was around the puck all game long. Players from Team Dzingel who stood out to me were Tye Ausmus, Biagio Lerario, Anthony Wyse, Danny DiGrande, and Josh Owings. My MVP of Team Dzingel goes to forward Biagio Lerario who hat the hat trick and could have easily scored 4 or 5 goals. He's been one of the top forwards in this camp thus far. Really impressed with his game. 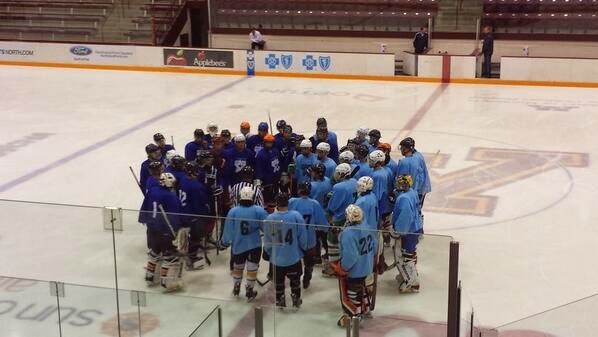 In a close one, Team Boll (Columbia) skated to a 6-5 victory over Team Bollig (Royal). Although still high-scoring, this game had much better flow compared to the first game. Scoring goals for Team Boll was Tristan Mullin, Dylan Malmquist, Adam Papaoyanou, Miguel Fidler, Dominick Mersch, Michael Gillespie. Scoring goals for Team Bollig was Endre Medby, Blake Brazil, Colton Fletcher, Dominick Sacco, Patrick Gazzillo. Team Boll goaltender Tommy Nappier played the first half of this game and gave up 2 goals. Team Boll netminder Tanner Holmes played the second half of the game and surrendered 3 goals. Team Bollig goaltenders Peyton Jones (first half) and Jake Berger (second half) each gave up three goals in their respective halves. Players from Team Boll who stood out to me were Dominick Mersch, Max Humitz, Dylan Malmquist, Miguel Fidler, Connor Frantti, and Lubos Vacek.. My MVP of Team Boll goes to forward Michael Gillespie. Although Gillespie is an undersized forward, he's fearless with and without the puck. Really impressed with his tenaciousness in this game. Players from Team Bolling who stood out to me were James Ladouce, Colton Fletcher, Dominick Sacco, Sam Field, and Josef Suska. My co-MVP's of Team Bollig are going to go to forwards Dominick Sacco and Colton Fletcher. Both players were on the same line and generated a ton of offensive chances. They seemed to have some very good chemistry. In a lower scoring affair compared to the other two morning games, Team Johnson (Grey) beat Team Bartkowski (White) by a score of 4-2. Scoring goals for Team Johnson was Sander Boroczky (3), and Jack Badini. Scoring goals for Team Bartkowski was August von Ungern-Sternberg, and Brett Horn. Team Johnson goaltender Cody Gibson played the first half of this game and gave up only one goal. Team Johnson netminder Quentin Prokopetz played the second half of the game and also gave up one goal. Team Bartkowski goaltender Hunter Shephard played the first half and gave up one goal. Team Bartkowski netminder Parker Butler started the second half and surrendered three goals. Players from Team Johnson who stood out to me were Cameron Lee, Hunter Anderson, Jack Badini, and Sander Boroczky. My MVP of Team Johnson goes to forward Sander Boroczky who had the hat trick and showed some good explosiveness with the puck. Players from Team Bartkowski who stood out to me were Wes Baker, Wyatt Kalynuk, Tristan Rostagno, August von Ungern-Sternberg, and Casey Dornbach. My MVP of Team Bartkowski goes to forward Wes Baker. As a free agent, Baker is relatively unknown to me, but he showed good poise with the puck in this game.